Don’t you just love it when you stumble upon a book that gets the wheels in your mind spinning and permanently changes the way you view the world. I certainly do. Hmm, I think I may have mentioned that recently. And before I fall into the temptation to give you an exhaustive list of those books, let me get to my point. 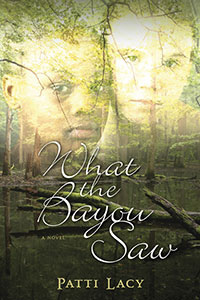 This summer I read What the Bayou Saw by Patti Lacy. You might recall that Patti is a former Inky, so you can imagine my excitement when I realized she had written one of those life changing books dealing with one of today’s toughest issues: racism. I waited until now to post this in honor of Black History Month. I’m shocked and sobered each time I’m reminded of how atrocious the racial situation was in America when my own parents were children. This book takes a look at the deep South in the 1960’s and will turn your stomach in a good way with the stunning and very realistic portrayal of racial injustice. The young girl in the story calls to mind Huckleberry Finn as she deals with guilt over desiring to love and accept the blacks around her. She has to hide her relationship with her new best friend, which leads to all sorts of horrendous trouble. Yet Patti Lacy forges bravely forward and withholds none of the awful details. Perhaps even more shocking than the glimpse into recent history, is the fact that the fictional present in the book is Midwestern America, where white supremacists are still wreaking havoc at a local university. This resurrection of racial issues in the life of the heroine forces her to face her haunting past. For me, this book brought up all sorts of thoughts and memories as well, but of a different sort. I grew up loving red, yellow, black, and white equally. So one of my first memories of racism was a story from my mother. During her teen years when a black friend of hers was forbidden entrance into a white friend's home, my mother was so enraged that she refused to enter as well and sat on the porch the entire time. And I recall my parents dropping me off at government housing for my African-American friend's birthday party. I’m sure it wasn’t easy for my overprotective mother to leave me in the ghetto, but I’m so grateful my parents sent me that message. I don’t say any of this to pat myself or my family on the back. And I don’t say this to try to talk my way out of my part in the racial rift in this country. Sometimes, as a people group, we need to repent on behalf of those who have committed atrocities. And on behalf of the white race, I am more than willing to apologize to the African-Americans in this country. It can be easy to turn a blind eye to racism today. To glibly act as though it doesn’t exist. To blame it on others. But instead we should press toward healing and racial reconciliation. There are still divides and hard feelings between races in our nation. I remember the night President Obama was elected. Although I could not bring myself to vote for someone with such blatantly liberal politics, I secretly hoped he would win. I kept all my prayers in the “your will be done” category, because I had a sneaking suspicion that God wanted to do a work in this nation through President Obama. I felt that electing our first minority president would have an impact on a spiritual level, and go a long way in healing old racial wounds. When I watched Obama’s victory speech, I clapped and cried along with everyone else. As the camera panned over brown-skinned faces filled with hope, my heart welled along with them. When Sasha and Malia walked confidently across the stage in their beautiful designer dresses, I knew I was witnessing history in the making. But racism still exists. On one hand Obama’s victory was a victory on the racism front. It proved to our nation that blacks are not inherently inferior and whites are no longer inherently prejudiced. On the other hand, the way we perceive race as an issue in this presidency points to residual problems. My brother recently moved to the Deep South, where segregation thrives. He quickly discovered that the new version of racism involves all the white people sending their kids to private schools, and his family is still struggling with how they should respond to this situation. Blacks and whites remain geographically, economically, and culturally segregated in that part of America. Let us all pray for a complete racial reconciliation in our country, and let us all look for ways to reach out and bridge that gap. Thank you, Patti, for bringing this important subject to my attention once again and giving me this opportunity to look at it through fictional eyes. What does black history month mean to you? What can you do to help bridge the racial divide in our country? What books have you read by African-American authors that have touched your life? Nice post, Dina. I do understand where you're coming from having lived in north, south, midwest. Actually, the place I saw the worst racism was in DAvenport, Iowa. I was pretty shocked after moving from pretty equality-driven Pittsburgh, wheremy friends were from all races. It was the Midwest, not the deep south. Sadly, that our president isn't doing well in his job is, too often, being blamed on his race, not his political and personal attitudes. Being aminority myself, it makes me cringe. And where I live I am a racial minority. When I found it necessary to let an employee go and hire someone else, for the sake of the first employees education, I made sure she knew I didn't replace her with a white person. I don't want to b labeled like some of the people down here because I am learning what it's like to be a racial minority, too, and hope I never have or do treat someone like I'e been treated here at times because I'm pale and blond and have a Welsh, not Hispanic, surname. It's sad and I wish this country had come further in two hundred years, and we, churches, Christians can only do our part by not propagating a problem that is not unique to this country. Look at france with Muslims and England with Indians. Look at the old west with American Indians. It just makes me sad. It wasn't the way I was raised, though I have family members... But that's a whole other matter. Thank you for bringing this up. It does need to be discussed and not swept under the rug. Yes, Lauire Alice, sad, difficult, and messy are words that come to mind when I think of racism. I grew up in Pittsburgh too, and I really was friends with everyone, although, I know their were some prejudiced older people in my home town. My current neighborhood is unusual in that it's toward the upper end of middle class, and we still have a nice racial mix. Dina! Nice surprise for my Monday morning! I book I recently read which combines a wonderful romance with probing of racial issues is Jennifer Valent's "Catching Moondrops." Patti, curious if it's CBA or ABA. Inter-racial relationships have been somewhat taboo in CBA from what I've heard. I'm sure this will be changing. As much as my parents were not racist, they were still cautious about us dating black people because they just felt like it was such a hard path. These days, in my children's generation, at least in my city, no one seems to care. It's almost a non-issue. My church, with it's worship that leans toward alternative in style, doesn't have a lot of black families. However, we've always attracted bi-racial families, and it's very normal to us. I went to Oral Robert's University. Yes, the man was a bit crazy at times. Prophets usually are. But, I always loved that he not only allowed, but encouraged inter-racial dating. He felt it was the quickest way to bridge this gap. Dina, this is beautifully written and presented. This is an issue that breaks my heart and make my stomach hurt. I am so fortunare in that this doesn't seem to be an issue where I live. Nor was it one when I grew up. I'm so thankful for that, and I wish it could be like this everywhere. PS, I forgot to say this makes me even more anxious to read Patti's book. And Patti, I also have the Jennifer Valent book. I'm looking forward to reading it. It turns my stomach too Suzie. And where I live, it's easy to just forget about it. Which is a blessing in some ways, but we still need to keep it in mind and in prayer. My sister and her Indian husband attend a huge church in Virginia Beach that has a special focus on being multi-ethnic. What a wonderful calling for a church. I know when George's family visits from Oklahoma they always go on and on about this congregation and how wonderful it is. They've had a hard time finding churches that fit them in the Midwest. Have just worked through how to write slavery/racial issues in my next book which is set during the Civil War. It's not easy to remain historically accurate without offending modern sensibilities. I'm eager to read Patti's book. Nice to see so many of our published author friends weighing in today. Hi, Golden. Good point. I know that I've been encouraged to write American historicals, but whenever I think of American history that I like, my mind immediately goes to Native Americans and African Americans and the struggles they've faced. Not exactly the cozy topics most publishers are looking for. I'm sure there has to be a niche though. And since we're talking great books on racial issues. I loooovvvveee Michael Phillips Shenandoah Sisters series. Can't beat that. That sounds like a pretty amazing church, Dina. I pray for a world that embraces cultural differences and yet treats and loves everyone equally. You should read Claudia Mair Burney's ZORA & NICKY - A NOVEL IN BLACK AND WHITE too--awesome look into modern racism that really makes you examine your own prejudices, even if you think you don't have any. What I loved about that was that it viewed it from both sides, with both the black heroine and white hero having to face the prejudices they had against each other's races. Oh, yes, Roseanna. I've heard great things about that book. In my study of sisterhood novels, I found many that dealt with friendships between the races. The Yada Yada Prayer Group. Faithful. And the Bloomberg series. My contemporary novel is about a young Muslim woman, a Christian ballerina and a bi-racial hippie chick and the way they all learn and grow from their relationships. Dina, Jennifer's book doesn't deal with a biracial relationship but rather two poignant romances and a kinda adoption. Well, I'm not doing the book justice--y'all just read it!!!! Catching MOONDROPS!!! Thanks for the link, Dina. I'll check it out when I get home from work. Patti, I looked up Catching Moondrops. It sounds amazing. And it's by Tyndale, the publisher I'm pitching my novel with the Islamic character to right now. Prayers appreciated. I have a real appreciation for African American literature. I love the soulful rhythms and the earthiness. Wonderful list! Add to it Nella Larsen, particularly "Passing,"
and DO NOT MISS Gayl Jones "The Healing" for an extraordinary and rarely trumpeted writer. Oh, "The Street" by Petry. Let me know if you want more; I've a shelf devoted to my master's study!!! Look again, Patti. Nella actually made the list. Read her in grad school. However, I donated all of my reasonably appropriate books to a local Baptist high school when I taught there. Sadly, the school was almost 1/3 black and the seniors hadn't read any African American lit. Booker T. Washington was a big hit. I could have sworn I left a comment this morning, Dina. Sorry--don't know what happened but I'm glad to have come back and read all the comments and suggestions. Sounds like some wonderful stories to read. Golden, I look forward to your Civil War set story. Patti, you're a real blessing to us. Thank you for your honest, thoughtful post. I remember having similar reactions when I read The Help last year. I found the book compelling but horrifying at the same time. I remember my father telling me that he was completely confused by the "colored" water fountains when he was stationed down south. I'm looking forward to reading Patti's book. Glad you made it back, Deb. We've had an interesting day as you can see. Can you believe it, Mary? Hard to fathom that these things took place not long ago. My daughter was in Hairspray in the fall. Another sobering reminder of racism in America during my parent's lifetime. I loved this line: "I remember the night President Obama was elected. Although I could not bring myself to vote for someone with such blatantly liberal politics, I secretly hoped he would win." We still have a long way to go in this country, but now when I tell my sons they can be anything they want when they grow up, it's really true. Joy, how beautifully put! Love your name, BTW, and have a character called Joy in "Reclaiming Lily" (who is actually Joy) Oh, you'll just have to read it...next fall! Joy is as beautiful as her name by the way! I'd like to improve on that. A more global world and cross-cultural opportunities will continue to benefit us all, don't you think? And so much more enjoyable! So true, Joy. It really made this a country of no limits. The world is getting smaller and smaller with the internet. Kids now play video games with people across the globe. That's going to make a huge change. Looking forward to it Patty! I agree with you on the stereotypes thing. I think we all have areas we could improve. We don't have very many African Americans in my community (less than 10 ... not 10 percent, 10 individuals). Where we see racism occurring is with the burgeoning Hispanic community and the immigration issues facing our country. Sometimes I think we as American Christians have completely forgotten the "for God so loved the WORLD" part of John 3:16. Yeah, I guess my bizarro international family is not normal, Niki. We still can't figure out how two sisters from Steeler country ended up married to foreigners (well, sisters husband was born here, but looks more foreign than mine). Only explanation is we both always had a heart for missions. Our university tried to instill in us to be "world" Christians and not just "American" Christians. Loved this book by Patti. Racisim is alive and well, sad to say. It's subtle things, like not being included at work. Moving into the neighborhood and people waving (or not) but never stopping to speak. The teacher offering to supply a child with paper when he needs writing help, when there's been no indication the parent can't afford it. The only kid on the baseball team not invited to a birthday party. Yeah, it's 2011, but we still have so far to go. If only we could TALK about racism without all hair-trigger accusations and baggage that tend to permeate the dialogue. Can we hear and accept that people are hurt and offended even when it's unintentional? Can we hear and accept that some slights were not intended and maybe really don't have anything to do with race and therefore shouldn't be viewed through that lens? And when things are intentional and malicious and offensive, can we unite to stamp out future such actions? I agree, Patricia. It can be hard to talk about. I can talk easily about this issue with black friends that I'm close to, but it takes time and effort to establish that trust. And when someone has been wounded, it's easy to be offended. But like you said, often it was unintentional. We all need to try to think the best and reach out in love.